Tonight I heard from a very beautiful lady from one of the leagues in the South. She was frustrated because just before she joined a league, it had split into two leagues because of some disagreement or another. I am not saying either group was wrong. She felt that after two years and the leaving of many of the original skaters, the situation should be resolved so they could compete against each other. It seems that the bad feelings for the split but not the original reasons still exist. Roller Derby faces some very difficult problems in just continuing to exist. To manage the leagues, collect enough dues, get enough volunteers and very importantly, get enough support in your market is not easy. Generally one league will do better than the other; some cities have up to 5 leagues. So what is wrong with that? Well, first of all, as I have stated before, skaters and teams can’t develop unless there are a certain amount of games in which they compete….so availability and distance become a problem and often this requires a travel team. (There will usually have to be a travel team when leagues are now playing others across America and Canada). But what if you could take all the leagues say within 50 miles and form a regional league that would give you the advantage of not just playing the other few teams in your home league. You create a genuine rival, league standings of more than a half dozen games and more players being able to compete against leagues of equal ability. There are certain natural city rivalries in Iowa, Indiana, Ohio, etc that could be cross promoted. It would be more comparable to other sports with each game having a meaning. You would really make your games mean something more than just trying to go higher in the rankings for regional and national competition. And each game would contribute to league standings which would give impetus to fans to attend as well as to a regional playoff that has nothing to do with the national championships. You have two of the top-ranked leagues in Denver, who rarely play each other at home. And there are many more examples. To quote Rodney King “can’t we all just get along?” and make our sport more powerful and more popular. Separating “social cult” derby from “pure sport” derby is an absolute imperative for growth and widespread legitimacy!! This is happening with our team right now, it seems. It’s a little unfortunate, I would’ve much rather us stayed together and did the A/B team, but we’ll see. Jerry, you are right when you suggest that leagues within a certain geographical area play each other and let natural rivalries form. It’s a great idea and a natural progression to the next level of the game. Unfortunately, I do not anticipate this happening. It’s how most teams play over in the UK. There’s only a small handful of teams that play regular intraleague games and an even smaller group that play intraleague almost exclusively. All of the other leagues travel all over the country and play each other. I totally agree! I think it’s unfortunate that we have so many teams splitting and creating new leagues. Colorado is a great example, especially as nearly every league in the state has managed a split at some point. I want to say we counted 12-15 leagues at last look. Could you imagine if we were ever able to reunite RMRG and DRD? We would be unstoppable! Minimum, don’t reunite them, you have two strong leagues…..just play each other and fill up the arenas! Always interesting, Jerry. Both leagues in Denver are affiliated with major promoters. I may be wrong, but I believe that contractually one of the leagues can’t play in the other’s venue. I think a contract would have to be altered by the promoter. I think that could be adjusted, as each one could have at least one home game in its own venue and that would be of huge advantage to the both Live Nation and AEG. I don’t know about splits, but most nearby leagues that I know in MO & ILL are due to geographical need (girls west of St. Louis would have to drive over an hour for practice but instead can play w St. Chux). The 2nd reason is there are more girls who want to play than the bigger leagues like Arch Rival can accommodate. Different people have different goals. Filling large venues is one goal some folks have. But fundraising, contracts, volunteer and/or paid staff is exhausting. Some of the most fun & competitive bouts I’ve played in have been in smaller venues or closed scrimmages. Just as valid as a sport. Don’t think this stuff is always about people wanting to just be a social club. Frankly, I’m tired of folks saying it has to be one way or the other. Ppl who like each other play better together. I can sympathise with the lady. I was with one forming league from the beginning, then when things were just getting started, a board of directors was formed and we had about 25 or so and we were learning basic skills, there was a split because of an internal disagreement. Now we have two leagues in a rather narrow geographic area; make that a VERY narrow geographic area just outside of Chicago, IL. Makes it easy to compete intraleague; but difficult in terms for recruiting new members. There’s our competition. Rocky Mountain Rollergirls’ Contenders will be playing Denver Roller Dolls’ Bruising Altitude (both B teams) on September 17th. Dallas Derby Devils play Assassination City Roller Derby in a sanctioned game this very evening, by the way. If there’s any antipathy between Denver and Rocky Mountain, it’s apparently in the past. They’ve collaborated to co-host 2010’s West Region Playoffs and this November’s WFTDA Championships. They regularly share interleague opponents (which has to save some travel comp money). The two leagues take turns hosting private sanctioned games on Sunday with the other league’s Saturday opponent. I wouldn’t be stunned to hear that they’ve got a collaborative arrangement as far as that goes. Outside of the examples I mentioned above, one big reason there’s so few “subway series” outside of tournaments is that if it’s unlikely to be a fairly even match, the game basically serves to advertise to fans that “they’re better than us.” There’s VERY FEW same-town leagues that would be likely to make for a fairly even match-up. I’d be thinking about places like Appleton, maybe even Des Moines and Denver? Possibly two of the three leagues in Toronto. If they split for bad reasons, they probably still hate each other. If they split for better reasons, they’re probably different enough to make it a blowout. Neither situation makes for a very fun game. But Jerry’s got a good point that Denver and Rocky Mountain could probably sell a lot more tickets together than they do separately. Rat and Rose seem to have a strong “cross-town” home-team rivalry even though they’re 180 miles apart (the latest episode happening tonight, in fact!). Denver and Rocky Mountain are 0 miles apart. I have no idea why they’re not putting together cross-league bouts with their non-traveling teams. 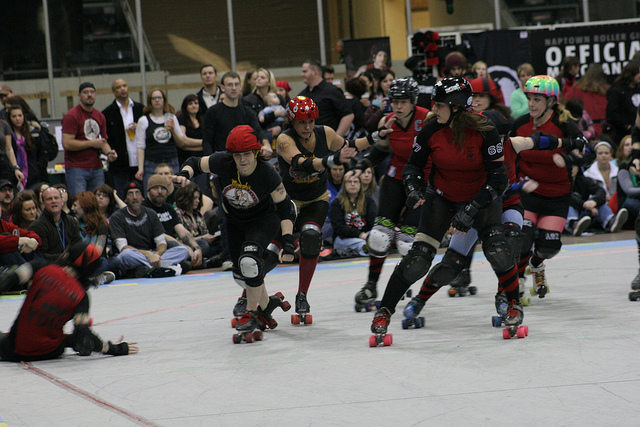 Who in Denver WOULDN’T want to see the Sugar Kill Gang vs. the Shotgun Betties? Right. We (RMRG) aren’t co-hosting Championships. (Whew!) But we are really glad to have them in town and will do whatever we can to help if DRD needs us. Next weekend we are having an RMRG/DRD home team tournament in our respective practive facilities. DRD’s is restricted on space, their season ticket holders will be getting first dibs on seeing those bouts. RMRG’s War*house can handle a bit of a crowd, so tickets are, like, $5 I think. Six teams across the two leagues will be competing. Saturday at DRD’s house and Sunday at RMRG’s house. Gonna be fun! I have noticed the general unwillingness to help each other out with some of these leagues and even the associations themselves which is pretty laughable imo. I can see a huge cannibalization problem happening and then Derby will slip back into the darkness as the public stops caring. Bad attitudes killed derby before and it could do it again. in my roller derby experience (6+ years) it’s towns where there are multiple roller rinks where this needless league split drama happens. Someone “takes their ball and goes home” — and there is somewhere else to skate and there are few barriers to entry for another league to jump in. League splits in small markets with lots of rinks are SOOOO depressing. Denver has enough people for two great leagues. Asstown, USA, DOES NOT. Get it together, small market egomaniacs. But, drama can be overcome, and it should for the good of the sport. We’re trying to slowly work (probably during the off season) in the local leagues from Mobile-Panama City to come to some sort of agreement and scheduling, officiating, etc., so we CAN travel 1.5 hours at most, and play each other versus driving 6+ hours, playing a bout, loading back and driving 6+ hours back so we can work in the morning. It can work, but all parties need to open lines of communication. I agree with you…why can’t we all just get along. It is life, things happen we don’t agree with but that doesn’t mean we just run from the situation, we work it out!! I think that there needs to be more help with the starting of leagues. New leagues should start out as recreational and as that grows you naturally develop a “travel” or competitive team. To have such negativity is horrible for the sport. Since I have gotten into Roller Derby, that is all I hear about, how new leagues are created because they couldn’t get along with the league they were in. Seriously I am not sure of any league in my area that has not started out of “bad” relations with another league. It is sad and until we can “all just get along” the sport cannot grow properly the way it potentially could. the rule in Derby seems to be help everyone in the sisterhood and brotherhood, but not necessarily in the neighborhood. It is tough enough to built up the sport and acceptance without the potential of decreasing your attendance. The issue sometimes is a typical one rule for one one rule for another scenario. Also People have tried to bring up issues and others are scared to speak incase their bout selection scores are affected. This nearly happened to our league. Luckily, we managed to stay together. Girls join to play and so rely on those at the forefront of their league to guide them. When this doesn’t happen, things fall apart. A lot of problems are just stupid politics, and tantrums being thrown. We are lucky to have had girls from leagues outside our own giving us a helping hand. It hasn’t been easy, but I think we are in a better place now. It’s general communication and thinking about the whole Team rather than ones self that will get us through! We have almost the exact same situation in our town… Only there are 4 leagues (2 mens and 2 womens). The one womens league keeps inviting the other to play and they continually get shut down by the other. Although due to the story being retold (of why “your team” thought the split happened) over & over again by both leagues there is A LOT of derby hate. Now you know why I dislike it when leagues proclaim themselves as the “first” and/or “only” in their area. I’d rather we keep the competition on the track and work collaboratively off it. I’ve seen situations in which two or more leagues started at the very same time in the very same region and did not even know it (one very valid reason I started the list). Unfortunately, instead of joining forces when they do find out, there is often a continuation of two struggling leagues on one area as opposed to one strong league. It just seems whatever drama causes splits its other drama that keeps them apart. In KC its more extreme Some in KCRW wont accept Dead Girl because they play MADE and now the Banked Beauties/Blazing Beauties has sprung from them. So now in KC we either have a really good thing in 3 potentially strong leagues under 3 different rule sets (Well Blazing Beauties when on a flat track are going to skate with WFTDA rules but primarily hope to skate banked as the Banked beauties) or we are going to confuse and split the fan base and no one is going to be as strong as it could be. I hope it works out for the positive. All we can do is try to create what we can while moving forward in a way that tries to keep the integrity intact. Hopefully there will be enough like minded leagues to agree to use the same rules to form a larger circuit beyond what exists. Imagine if we could do that! Skills before drills, athletes with athletes, people who cross train with others who have the same agenda. We need venues where people can learn and not be threatened by their team members surpassing them in skill level. People who are there for the social aspect are valuable too, they should just be on teams that are like-minded and have a different level of game play. Our leagues have “a” and “b” which we call “team tough” and “team speed”. Only skaters who are ready can play on team tough and we all work to help team speed gain the skills they need (or want) to put more into the sport. If we can make room for varying agenda within the same leagues I think the splits would stop. All I can do is share what works for us and hope for unification with a larger circuit. It is very difficult to have the criteria for a roster clearly outlined in black and white. All too often I’m afraid it comes down to popularity or something that I don’t quite understand when it should be about skills and skaters who work well together. Sometimes, the splits are natural… and good for the overall good of the sport, shedding the “bad elements,” so to speak. They have shared their love of the sport with my 14 year old daughter, and it’s always wonderful to see her grow in the game. There is another “team” in my town composed of people who were not able to make the ARG teams. I learned about them when my daughter’s junior league finished up and we were trying to find a group to practice with until the city league started back up. They said that she could skate with them until they found an official place to practice, then they would have to revert to 18+. She worked hard over the next two weeks, out-performing many of the ladies there and learning from the better skaters. From day one, they were asking her where she was going to skate when she turned 18. …but she was welcome to help them raise money! I had to address my daughter’s questions of “What did I do?” and “Why are they doing this to me?” on the way home in the car. She nearly lost all interest in derby altogether. I later learned that the same girl who told me she couldn’t skate there had given my daughter problems during practices, including “offering to help her with her skates so they would perform better,” but tightening her trucks so hard that her junior league coaches were trying to figure out how her equipment would have gotten screwed up so badly. Really? An adult intimidated by a 14 year old kid so badly that they’ve got to risk injuring them? Sometimes, there are groups with no class at all… and if they split off and disappear, then good riddance! Derby is such a great sport, and it doesn’t need people like that making the sport look bad.